Although it ‘tis the season to celebrate, its also the season during which many people experience problems with alcohol. In past, CPDDBLOG highlighted research from Finland showing spikes in alcohol-associated deaths during the Christmas and New Year holidays. Now, a new research study from Australia documents a remarkable increase in the use of health system services by those intoxicated with alcohol during New Year celebrations. The report analyzed ambulance, emergency room, and hospital admissions records collected in Melbourne from 2000-2009 to determine whether there were increases in alcohol-associated cases before, during, and after public holidays and major sporting events. 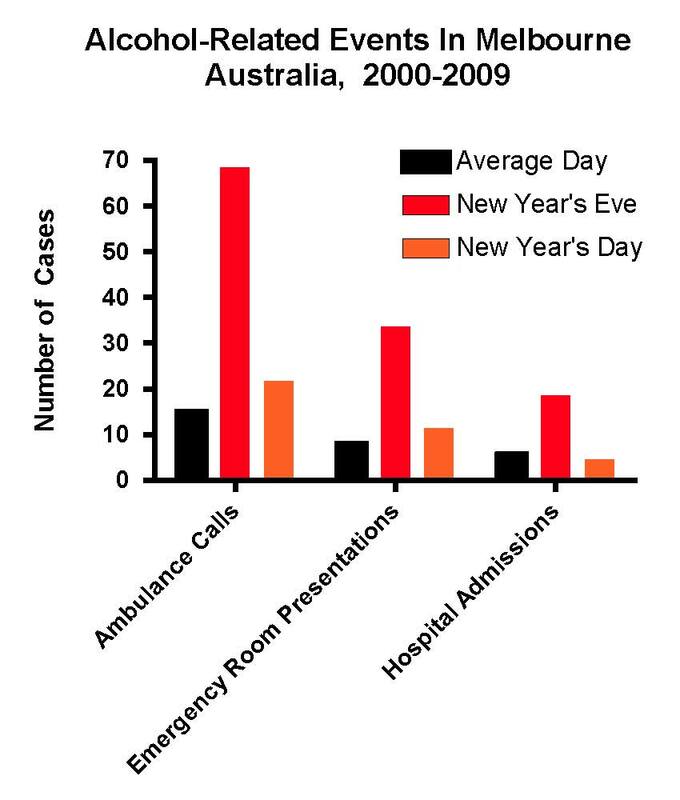 On New Year’s Eve, ambulance calls and emergency room visits involving alcohol intoxication increased by more than 4-fold, while hospital admissions involving alcohol intoxication increased by more than 3-fold those occurring on an average day (Figure). 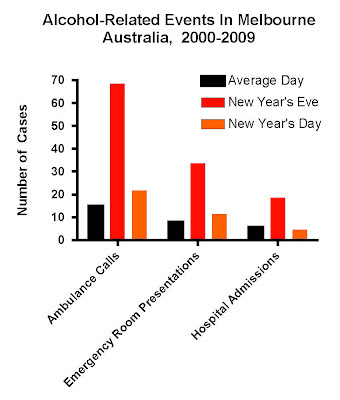 Of all the events analyzed by this study, New Year’s Eve effects were the largest. Unfortunately, United States statistics also are grim. According to the National Institute on Alcohol Abuse and Alcoholism (NIAAA), during the year-end holidays, death rates from alcohol-related crashes increase by 3-fold and 40% of traffic fatalities involve intoxicated drivers (PDF). Thus, if you plan to consume alcohol over the New Year holiday, as the song goes, “you better watch out”. Fortunately, more and more people are aware of these statistics and are doing things to reduce alcohol-related problems year round. NIAAA’s “Rethinking Drinking” website offers a number of tips to help determine whether one's alcohol consumption may be problematic as well as tips on how to reduce drinking. For those trying to avoid drinking while attending parties at which there may be social pressure to consume alcohol, the New York Times recently published an article with useful strategies such as identifying oneself as a designated driver. If you want to ring in the New Year in alcohol-free environments, the Office of National Drug Control Policy published an article including a link to a regional list of sober New Year’s Eve events. We wish you and yours happy holidays and a happy and safe New Year!